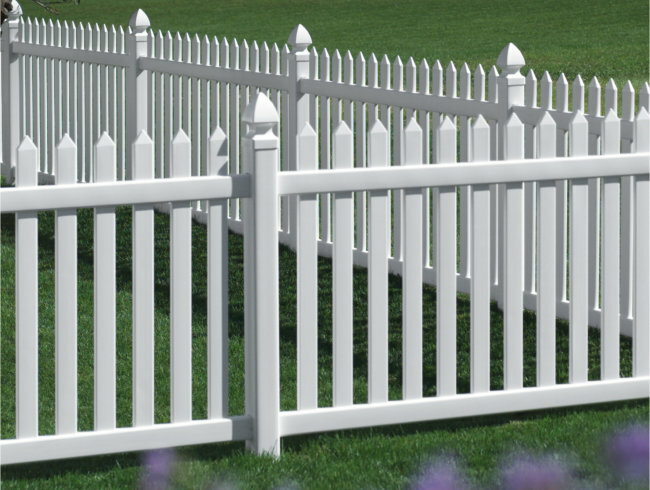 We are happy to announce that Signet Fence now sells Bufftech Vinyl Fencing online. Check out some of our most popular styles. 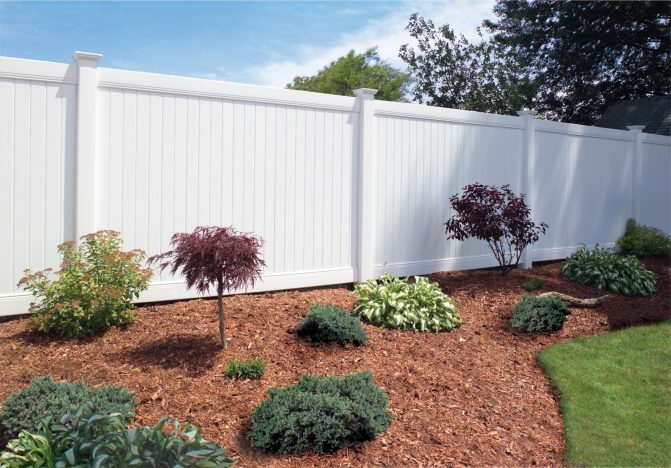 The Bufftech New Lexington is an economy vinyl privacy fence that has been redesigned with many of the premium features that you would expect in a high end model, including: tongue and groove pickets, curve deco rails, and a steel reinforced bottom raill to prevent sagging; all for less than $16 per ft.. Available in both white and tan, the New Lexington looks great standing alone or when accented with vibrant colored landscaping as in the picture below. The Bufftech Chesterfield with CertaGrain is a top of the line vinyl privacy fence with authentic looking wood grain textures. It is available in 7 beautiful colors that blend with the natural elements of your yard, rather than overpowering them. Chesterfield with CertaGrain also features Bufftech's exclusive ColorLast Dark Color Protectant which reduces fading and maintains the natural appeal throughout the life of your fence. Chesterfield meets ICC residential pool barrier codes (talk to your local zoning office to make sure that it meets local codes). 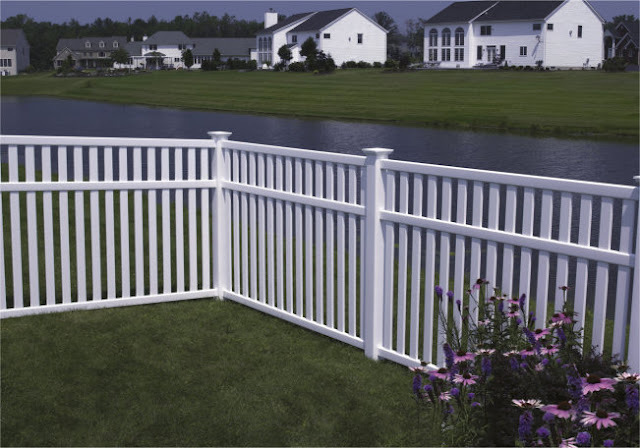 It is a popular vinyl fence option for both large residential developments and DIY projects. Bufftech Baron is a contemporary pool fence with a clean, modern looking design. 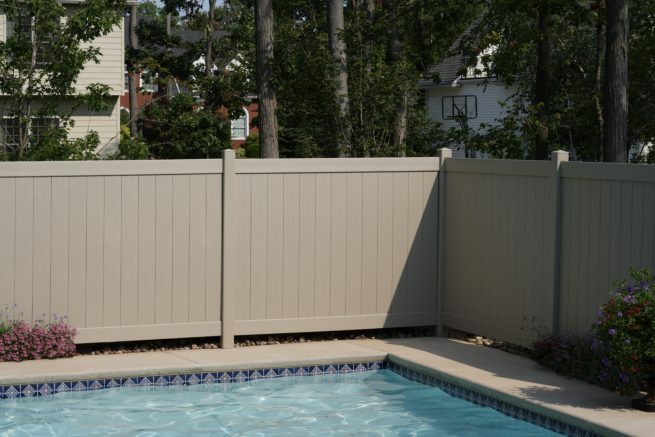 A beautiful looking fence around the pool or the front yard, the Baron has vinyl picket spacing that meets the standards of the residential pool code, without impeding the view. A great, low maintenance alternative to the classic wrought iron pool fence. The smooth finish Baron is available in both White and Tan colors. A classic 4' picket fence that you never have to paint; the Bufftech Danbury will enhance the look of your home for a lifetime with a minimal amount of work. Plus, with its good Neighbor design, the Danbury looks great on both sides of the fence unlike wood picket fences that require nails and/or brackets. Dress it up with solar post caps and create a perfect contrast of classic and modern styles. Available in White and Almond. Bufftech, which is manufactured by Certainteed, sets the bar in quality, affordable vinyl fencing. A pioneer in the industry, Certainteed has manufactured building materials in the United States for over 100 years, and they have a history of innovation and technical excellence that few, if any, other vinyl fence manufacturers can offer. Part what sets Bufftech Vinyl Fences apart from other brands is Certainteed's attention to the details; like offering a wide range of color and texture options instead of just white, precision routing all posts to eliminate the use of installation hardware and adhesives, and reinforcing the bottom rail of all fence panels with steel to prevent sagging and ensure that the fence maintains its aesthetic clean lines. They are extremely user friendly due to their ease of installation, low maintenance, and industry leading lifetime warranty. They are cost effective. True, vinyl fences have a higher up front cost; but, over the life of the fence, they can cost up to 75% less than natural wood fences when you factor in maintenance and replacement costs. They are safer for children and pets - Bufftech Vinyl fences have smooth surfaces with no nails, splinters, or sharp edges upon which children or pets could cut themselves. This also means that they are extremely difficult to climb over. They are building code compliant. They come with an industry leading, lifetime limited warranty. What is the ICC Pool Fence Code?